CWA Local 2204 and Next Gen are CWA STRONG! Contracts expired for 14,000 CWA members at AT&T Midwest and AT&T Legacy T on Saturday night. Workers remain on the job but are ready to strike if negotiations stall. "Our members remember the big promises that AT&T CEO Randall Stephenson made if the corporate tax cut bill passed, and now we're holding AT&T to those promises," said CWA District 4 Vice President Linda L. Hinton. "Our bargaining team is committed to negotiating a fair contract that keeps good family-supporting jobs with affordable health care and a secure retirement in our communities. AT&T should not underestimate CWA members. They are ready to do whatever it takes to get a fair contract with AT&T Midwest, including going on strike if we aren't able to make progress at the bargaining table." "The concessions that AT&T is demanding are insulting," Vice President of Telecommunications & Technologies Lisa Bolton said. "AT&T made nearly $30 billion in profits last year, and is reaping major benefits from the passage of the corporate tax cut bill. They can afford to keep good family-supporting jobs in our communities instead of laying off workers and sending their work to low-wage contractors. Our members have overwhelmingly authorized a strike if necessary, and that is still an option." Members of Local 4603 held a rally in Milwaukee, Wis., on Saturday night as the AT&T Midwest contract expired to show the company that members are ready to do what it takes for a fair contract. CWA reached a tentative agreement with the Murphy Administration this week, securing a huge win for 35,000 state workers in the executive branch in New Jersey. The agreement comes after nearly 3 years of fierce – and often stalled – negotiations with the Christie Administration, during which the former NJ governor refused to pay workers' salary increments and blocked arbitration attempts. "We achieved our goals," said the bargaining team in a memo to members. "The contract improves on the pattern set by other settlements and sets a foundation for our next contract." The new contract addresses all retroactive increments and clothing allowance payments, provides two across-the-board increases of 2%, and came with no concessions – a major victory rewarding years of solidarity by CWA members throughout the state and the hard work by the bargaining committee. 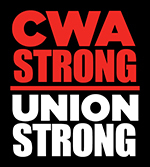 CWA members at Frontier Communications in West Virginia and Ashburn, Va., have voted to ratify a new 4-year agreement. CWA members fought hard for this agreement, negotiating with the company for more than 11 months, and spending 22 days on strike. Thanks to their unity and perseverance, along with the unwavering support of working people in West Virginia, Virginia, and across the country, CWA members at Frontier won an agreement that raises wages, maintains affordable health care, and expands job security to all of their members covered by the contract. This is a major achievement, and it shows what working people can do when they join together to stand up for themselves and their communities. The CWA passenger service agents at Piedmont Airlines will begin mediation with the company in July with the goal of reaching a fair agreement with family-supporting wages. 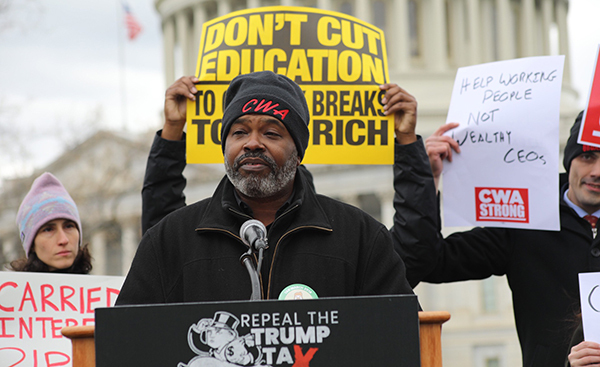 CWA members across the country held events on Tax Day to highlight how the Republican corporate tax cut bill is a massive giveaway to big corporations paid for by working families, and to rally their communities to fight back. Former AT&T call center worker and CWA Local 4004 President Merle Milton of Detroit spoke at a rally in Washington, D.C., calling out the company for recent layoffs in Michigan and across the country. "This December, AT&T announced that they were closing the call center where I've worked for 25 years," said Milton. "My co-workers and I worked hard to provide quality customer service and help grow AT&T into the successful company it is today. But instead of rewarding us for our dedication, AT&T is pulling out of our community and taking our jobs overseas – undermining customer service and hurting hardworking families. Workers deserve better, AT&T customers deserve better, and cities like Detroit deserve better." CWA members are pushing Congress to pass legislation to fix some of the worst parts of the tax bill. Senator Tammy Baldwin (D-WI) has introduced the Reward Work Act, supported by CWA, which would prohibit harmful stock buybacks. Instead of raising wages and creating jobs, companies have been using their tax cut windfall to purchase their own stock, which enriches top executives and large shareholders. Despite promises from House Speaker Paul Ryan and other top Republicans that the tax bill would end offshoring, the tax bill actually contained incentives for companies to send jobs overseas. Democrats in Congress are rolling out legislation to remove these offshoring incentives and keep jobs in the U.S. Congressman Lloyd Doggett (D-Tex.) and Congresswoman Rosa DeLauro (D-Conn.) have introduced the No Tax Breaks for Outsourcing Act with Senator Sheldon Whitehouse (D-R.I.). Read CWA President Chris Shelton's statement on tax day 2018 here. 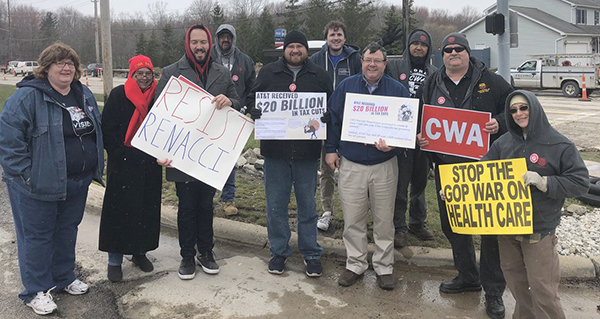 Top: CWA members and allies held a press conference outside of Congressman Jim Renacci's (R-Ohio) office in Parma to educate the public about how the new tax law in effect this year will harm working families. Bottom: Former AT&T call center worker and CWA Local 4004 President Merle Milton of Detroit spoke at a rally in Washington, D.C., calling out the company for laying off workers after receiving a massive windfall from the Republican corporate tax cut bill. 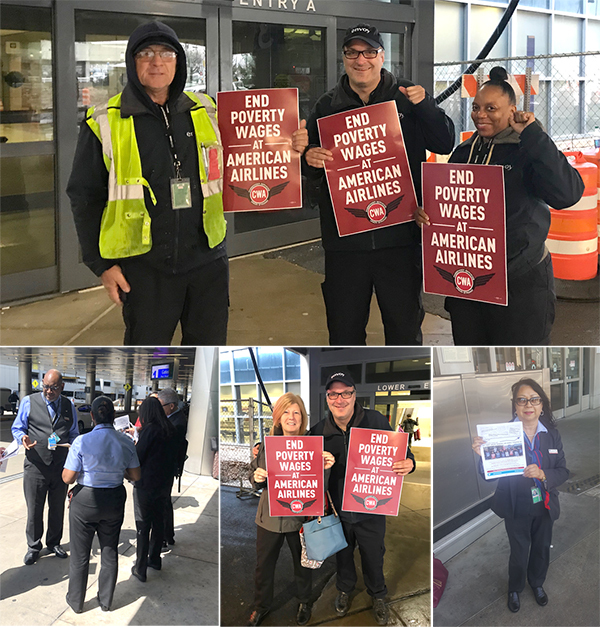 Passenger service agents from American Airlines' subsidiaries Envoy Air and Piedmont Airlines, members of CWA, gathered at airports across the country on Monday – ahead of Tax Day – to rally for sustainable, family supporting wages. American and other corporations are facing national scrutiny over how they have used benefits from the Republican corporate tax cut bill that they claimed would lift wages for working families. The company posted $1.9 billion in profits last year and is expected to reap millions from the tax bill, but Envoy and Piedmont agents have faced years-long delays in contract negotiations, with both companies refusing to address the critical issue for working families: permanent, sustainable wages. Passenger service agents from Envoy Air and Piedmont Airlines rallied for sustainable, family supporting wages. New York Governor Andrew Cuomo stood with working people by signing legislation that makes it easier for public workers to join together in unions to negotiate a fair return on their work. This bill is an important step to support union membership in the face of the Janus Supreme Court case, an attempt by corporate special interests to take away the freedom of working people to come together, speak up for each other, and build a better life for themselves and their families. CWA Local 1180 President Gloria Middleton attended the signing along with a dozen other public sector workers from Local 1180. From Memphis to Johnson City, United Campus Workers (UCW-CWA) members held events across Tennessee this week for an Adjuncts United Week of Action, revealing the Adjunct Faculty Bill of Rights with four key demands to improve working conditions for adjunct faculty. Events were held at the University of Memphis, Austin Peay State University, Pellissippi State Community College, East Tennessee State University, and others. The Adjunct Faculty Bill of Rights calls for improvements in compensation, regular and prompt pay periods, course prep fees, and job security. 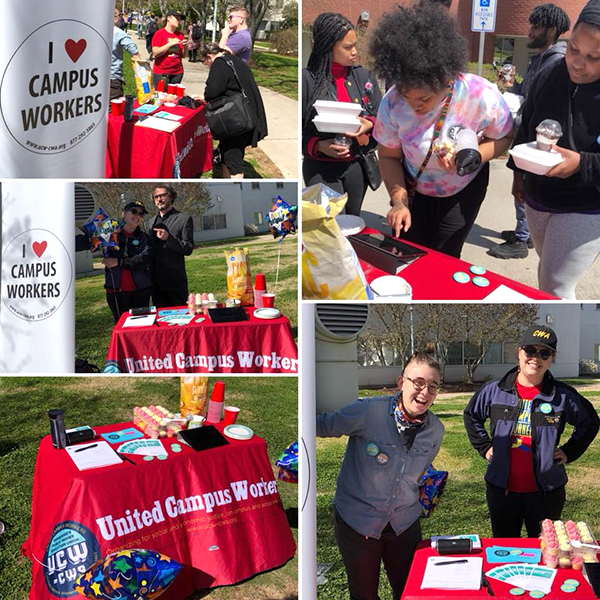 At Pellissippi State Community College, UCW-CWA members set up information stations to raise awareness of adjunct working conditions. Thanks to thousands of emails and phone calls from CWA members, the U.S. Senate failed to pass a bill that would have removed protections for working people on Native American lands. If the bill had passed, roughly 800,000 workers would have lost all federal protections for their right to join together as union members to fight for better wages and working conditions. Casinos and other big business interests opposed to worker power worked with Republican leaders in Congress to make this bill a major priority. 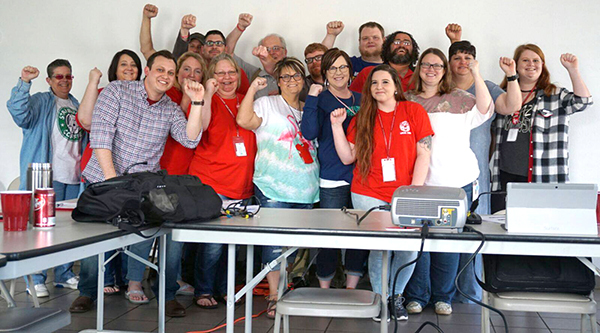 Wireless workers from AT&T Mobility, Verizon Wireless, and T-Mobile joined a CWA town hall call this week to share their stories about how they are standing up for their rights here in the U.S. and around the world. As a first step in improving working conditions in the wireless industry, workers across the country are signing on to the Wireless Workers United Statement of Principles. "In talking together, it became clear really fast that we all share the same goals when it comes to pay and metrics and our desire for good jobs that support our families," said Maritza Lara, who works at a T-Mobile retail store in Laredo, Texas, and is a member of T-Mobile Workers United. "We all want good wages, fair metrics, and an end to the pressure to engage in unethical practices. The Statement of Principles that we wrote together is our vision of what a wireless industry with integrity would look like." CWA Local 2204 and CWA Next Generation – a project of CWA to recruit, train, and mobilize young CWA members – teamed up for a CWA STRONG training in Lebanon, Va., this week. Next Gen Lead Activist for CWA District 2-13 Justin Tapia led the training and signed up several new Next Gen activists.